We got a kick out of seeing our photo of Tiny and Baby right above Michelle Malkin's signature portrait logo at Pajamas Media. 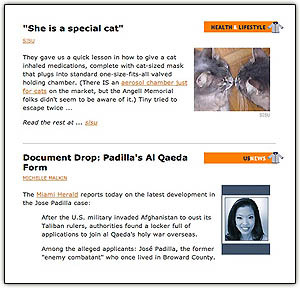 Note also our latest catblogging entry is featured under "Health & Lifestyle"
Pajamas Media has a fresh new look and functionality. Organized for easy reading with links in the left column and ads on the right, it features a stream of frequently updated blog-post teasers in the main, center column, with links, images and categories such as "World News," "Culture," "Politics" and -- our personal favorite -- "Health & Lifestyle." We love the orange-and-blue color scheme. Those are the colors of dawn, complementaries -- opposite each other on a color wheel -- that each enhances the visual impact of the other, as Impressionists like Monet illustrate in their dazzling paintings of light. Summer sunrise down Goomp's a couple of years back, photoshopped to suggest Monet's painterly light effects as in "Haystacks: Snow Effect" (oil on canvas 1891). "To capture the fleeting effects of light and color, however, Monet gradually learned that he had to paint quickly and to employ short brushstrokes loaded with individualized colors. This technique resulted in canvases that were charged with painterly activity; in effect, they denied the even blending of colors and the smooth, enameled surfaces to which earlier painting had persistently subscribed." Other combinations produce a phenomenon called "afterimage" that occurs when a viewer breaks a prolonged focus on an image to rest his or her eyes on a blank space and then perceives a reflection of the image with complementary colors and opposite light values. With a nod to Joseph Albers's exhaustive squares-within-squares explorations of color relationships, we've set up PJM's orange and blue above to illustrate the afterimage effect. 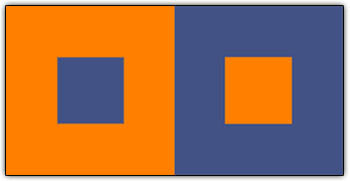 Stare intently 5-10 seconds at the small blue square, left, and when you look away toward a white surface, you will see an orange square inside a blue square. Then stare at the orange square, right, and you'll see a blue-inside-orange afterimage. There are lots of other color dynamics going on here -- the small blue square appears smaller than the small orange square although both are the same size, for example -- but we'll save those for another day. This is interesting: a gene called P11 and its related proteins may play a role in chronic depression. Those of us who have problems with this particular malady are always on the lookout for stuff like that. There's an old question when it comes to the brain: if you see differences in brain construction associated with a behavior or malady, does that mean the oddity you see caused the problem, or did the brain difference you see simply come about due to the problem? Be sure to click on over and read the whole thing. Everyone we know is either subject to bouts of depression or knows someone who is. *Tiny's fans will be pleased to know that she is doing fine this morning, her first full day back home after her recent stay in the hospital, where they diagnosed, stabilized and developed a regime of oral steroids and inhaled medications for her feline asthma. She gifted us with three nose-bites this morning in the pre-dawn breakfast-campaign hour. Update: A most engaging -- and poignant -- 94th Carnival of the Cats up at Niobium. Not for the faint of heart. Scroll down to the bottom of the post for "Rainbow Bridge," an homage to kitties who pass to the other side before us. Love the sunrise photo painting. Even more beauty than one would expect in an expected place. If one follows the PJ Media one will learn more than one expected from the media. Simply fantastic post and it's why I read this blog daily. Your writing style is a soothing potion for the mind. Heh - I thought I had commented on yesterday's post about Tiny... guess I hit preview and not post (ARG!) Anyway, sounds like she's doing so much better - that's wonderful. Love your photo/painting combo, just lovely. Of course I have often loved the pics you post from Goomps, what a beautiful place. Beautiful Sissy. I learned more about complementary colors in this post than I did all the years I majored in Art. But there is more....as there always is at sisu....the report about Tiny and the medicine administered to her. Since I have been going through the challenge of getting the medicine down Captain this post is instructive and comforting. Another not fun day. Our daughter and son-in-law found out that their cat, Skitters has kidney failure. They are very upset. Skitters is about ten years old or maybe older. I am so sorry about Skitters's illness, Laura Lee.